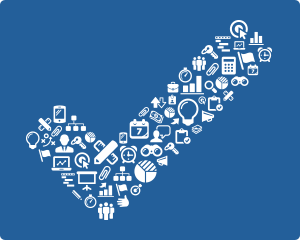 Do you have a proven process for project management and business success? Think about the tools you have in place to drive and track your business activities, projects and staff toward the common goal. Are you maximizing your time and capitalizing on activities that make sense? Hoping for the best and flying by the seat of your pants is not a plan for success. It's a plan for random activities that lead to nowhere, with little fruition. Last year, I and another colleague decided to work together as accountability partners. We realized that we needed to introduce and develop stability, strategies and structure into our businesses. We wanted to work smarter and better on our business goals and in project management. We had goals, but we weren't achieving them. You see, we never thought to put those goals and aspirations on paper, or map out a viable plan, much less think that project management tools could be helpful in tracking our daily activities and progress. So when my partner and I discussed our goals for creating a strategic plan to get those ideas out of our heads and onto paper, we realized some key pieces were missing. In fact, we had no way to manage or monitor our daily activities. After we implemented a strategic plan, using the exercise and tools outlined in my mini-guide entitled, "Your Strategy To Succeed – The What, The Why, The How Of Strategic Planning" we experienced collective eureka moments. This resource – along with the two special project management tools recommended in it – are now essential to our ongoing progress. What follows is how we developed (as any business owner can) a realistic overall picture, and visualized the smaller targets inside them so we could take action. You see, my colleague was at once inspired and put her plan into action. She was in the process of developing a new business idea. And these two templates enabled her to instantly and clearly visualize what her business would look like one-year out. Especially once she began implementing the Project Management and To-Do list tools to map out and manage realistic timelines. And while this is not a new concept, it did prompt us to focus on how to break down this big picture into workable (individual) projects, and go even deeper into their respective/related tasks. A plan is only as good as the actions you take to make success happen. In order to support a strategic exercise and to reach your goals, you need to have additional productivity, project management and tracking mechanisms in place. These elements are crucial to help monitor business progress, mark milestones and deliverables, assign resources, set deadlines, and more. And from my and my colleague's experience, we recommend these two templates in particular from Vertex42.com's amazing repertoire to support your ongoing work. 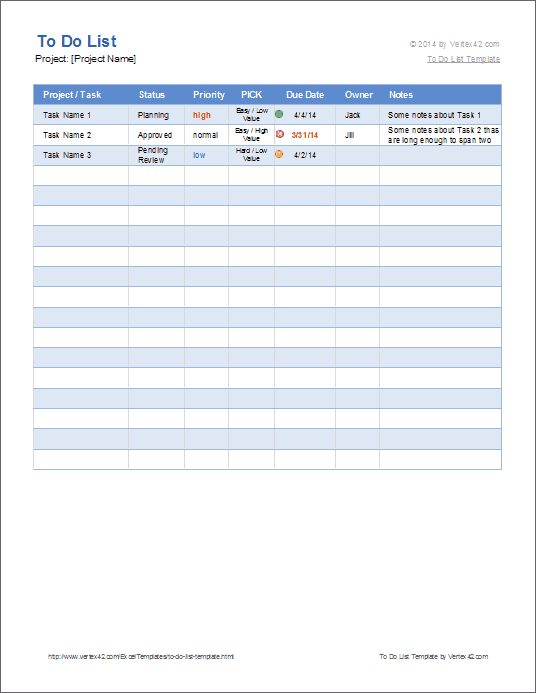 Vertex42 has a number of project management templates to choose from, but this particular Project Tracker template suited our needs. It's perfect to map out the bigger picture (separate projects); establish time frames required to complete the goal (one year out, for instance); identify project-specific activities or tasks; and assign staff to carry out those individual activities. For example, one of your projects might be your blog publication calendar. Most businesses publish monthly. In that case, break your blogging process down into its specific activities, anticipated deadlines and staff you might need to have involved for each one. Identify what tasks are to be carried out for each article to be published, estimate how much time each requires and assign the start- and due-date to make sure it gets done; and identify who will do the work for each of the tasks. 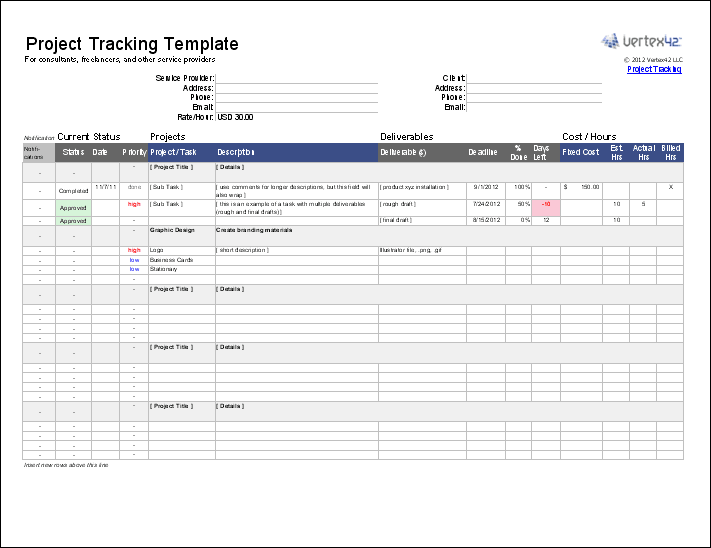 Then monitor progress and carry out follow-ups through both of your project management tools. Before using these templates, my colleague was struggling big-time to make sense of how the smaller elements fit into her new plan for her business idea. She was unsure how she was going to convert her overall plan into something trackable, actionable and successful. Not so anymore. Now, these two templates help us both tremendously. In fact, we're so impressed with them that we mention and recommended them to our colleagues and clients every chance we get. They have become an invaluable part of our (client) writing projects as well as for framing our own new business ideas. "...I was able to formulate and clarify my mission and vision statements and my plans for moving my business forward, from the big picture right down to the smallest detail..."
She now understands what major resources and elements she needs to have in place to achieve her end-goal. She's also able to monitor the smaller, more integral activities that support consistent business progress. Let's recap. No business moves forward without a detailed outline or strategic plan…that's a recipe for encountering distraction after distraction. On the other hand, knowing what you are working toward and how you're going to get there serves as a clear guide to achieving that final goal. Think about the bigger picture – your desired end-result. Break it down into executable individual projects/tasks. Use reliable tracking/accountability mechanism tools (like the ones available from Vertex42). Apply realistic strategies for each activity. Share the big picture with the entire organization so each staff member understands his/her role, and appreciates how he/she contributes to the end result. Refrain from engaging in activities that don't align with your overall business goals. The most important step in this exercise is to get the support you need by incorporating the right tracking tool for the activity. In doing so, you'll have a much better chance of achieving your company's future goals. Furthermore, creating a strategy and using the right project management tools keeps you from venturing into areas that don't align with your ultimate goals. To that end, my colleague and I recommend Vertex42.com as our preferred source for these valuable tools...so much so it plays an integral part in my resource, as noted above. I know when you map out your strategy using the right support tools you'll save yourself a lot of valuable time and heartache. And if you need help in your strategic process or project management, be sure to reach out. If you found the information in this article helpful, share your feedback or questions. Thank you for your interest. Shelly specializes in writing real estate descriptions, using seven principles of effective sales letter writing. In addition, her 30 years experience in an administrative environment plays an ongoing role in how she works with, plans and strategizes for better results with clients from many industries. This is very informative article! Very useful guide on project management. Are these templates designed using excel? 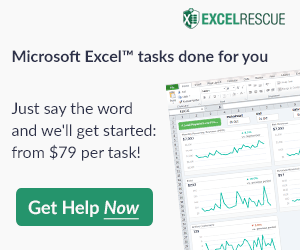 @Ryan … Yes, the templates mentioned in this article are available for Excel and also for Google Sheets. Thanks for taking the time to comment on this article. I’m glad you found the information helpful. Do feel free to connect if I can answer any other questions. Shelly Moreau (author of this article).